It’s Friday so I have a cake situation! 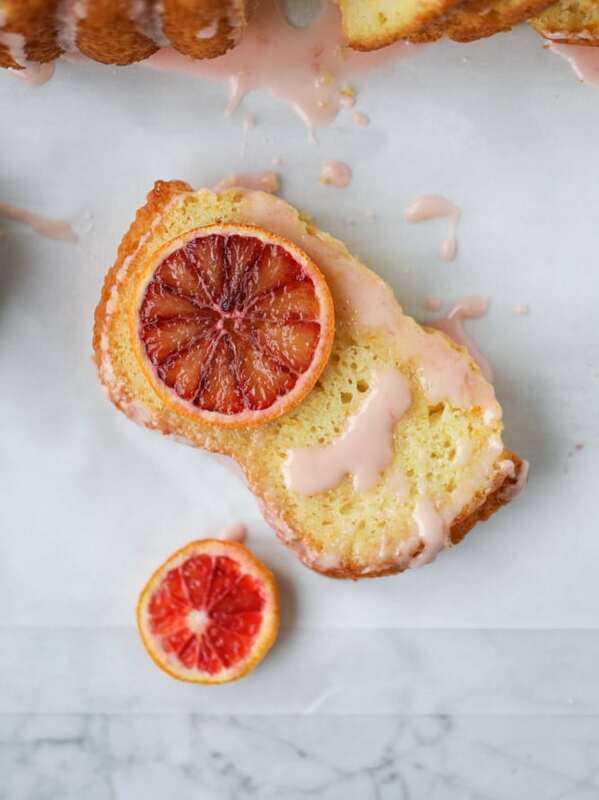 This blood orange cake is not a bad situation to have. In fact, I wouldn’t mind having this situation around allllll the time. We’re 26 days into the new year and I have yet to share a LEGIT dessert with you. I know, I know, I made these champagne rice krispie treats for the golden globes, but those were made with brown rice and therefore a total health food. I don’t see it any other way. This is real cake! But in an easier-to-use loaf pan. Because I have zero patience. My grandma made the most killer orange cake (you can find the recipe here!) and I always wonder what it would be like with blood oranges, so that might be next on the list. In fact, I might do it today because I haven’t been able to get the idea out of my head. It would also be such a fun surprise for my mom! Also. Can we talk about this juicer? It’s my newest obsession. In full disclosure, this was sent to me by Crate and Barrel (this is not a sponsored post, but I create recipes and videos for them and they send me the product to feature!) and isn’t something I ever thought that I’d want or need. I have a real juicer – like the crazy heavy duty ones that ruin your life because they are easily the worst kitchen appliance to clean in the history of the universe. Combine that with the fact that if you don’t clean it right away, you basically have to throw it in the trash because it’s ruined forever, and you will use that thing once or twice and be done with it. OH. ALSO: it sounds like a jet engine is flying through your kitchen too, so that’s great. 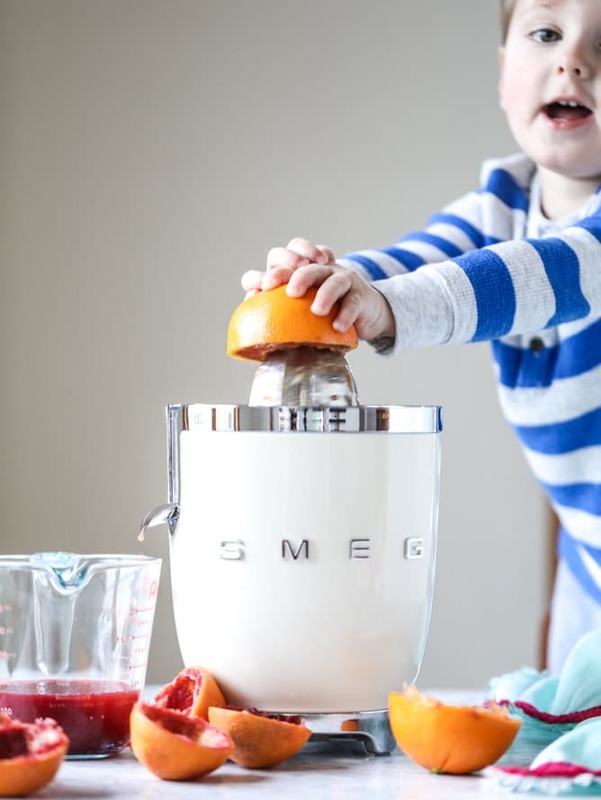 But anyhoo – this citrus juicer. We have used it every single day. 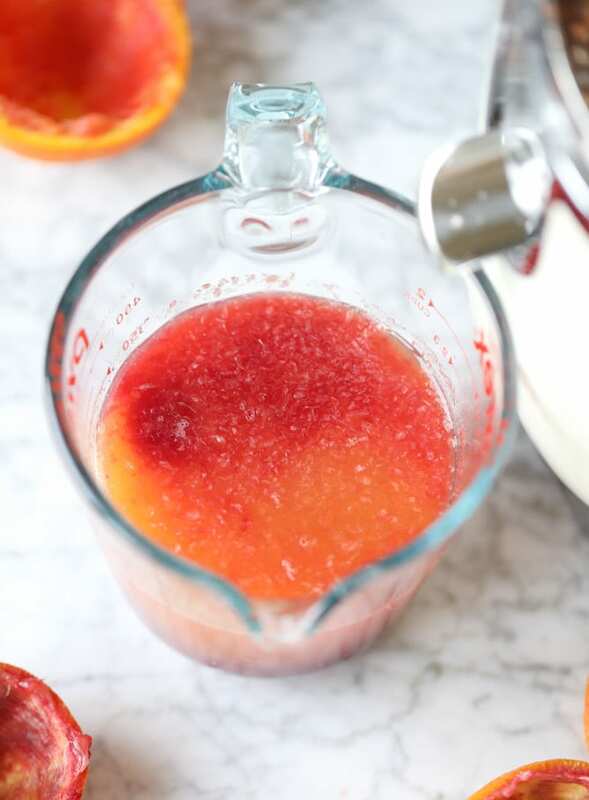 Max and I have been using cara cara and blood oranges to make orange juice and it is super easy. Not to mention delicious. And I don’t even like juice! It’s really easy to clean too and doesn’t take up a ton of space. I’m obsessed with making fresh orange juice on the weekends, but the biggest thing is that I love lemon and citrus desserts so much and juicing them all by hand can be CRAZY. Especially if you have a large orange or grapefruit. When I make orange cookies at Christmas, I practically get carpal tunnel. MORAL OF THE STORY: you don’t need this exact juicer, but an electronic citrus juicer is now up there with my favorite kitchen gadgets. Who knew? SO. This recipe is pretty much just like the lemon loaf cake that I shared last year and ADORED. There is a bit more juice in this one and the flavor is so wonderful. It’s super hearty – almost like a pound cake, but light enough that you don’t feel weighed down by eating a slice (or three). 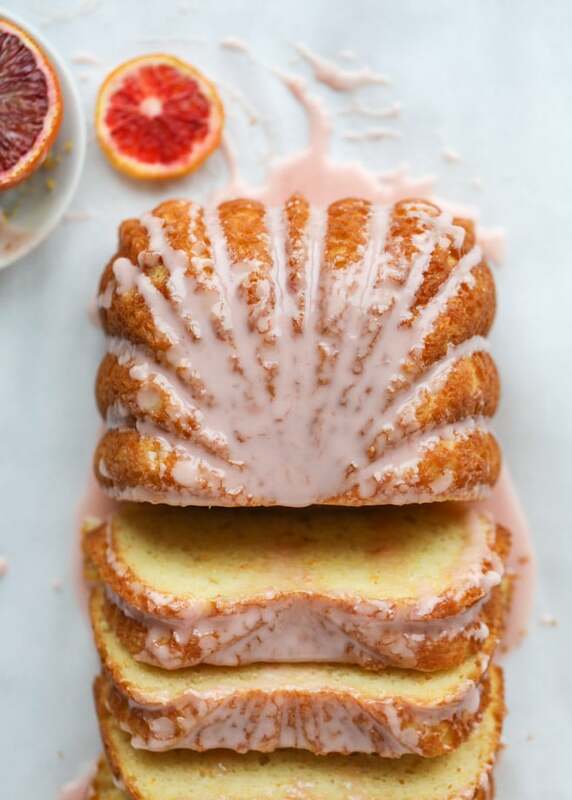 Citrus desserts for the win! It’s so pretty too! 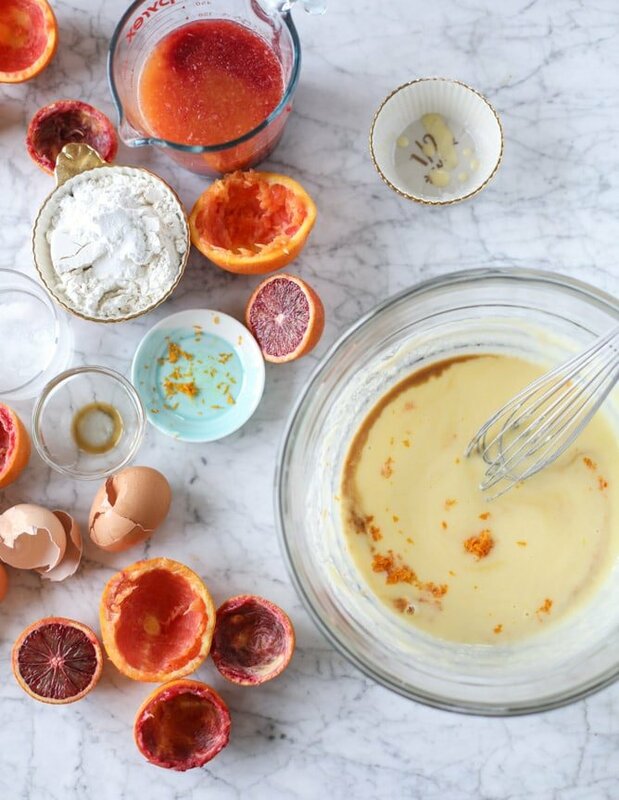 Because blood orange everything. Would we love blood orange as much if it was in season all year round? I actually think we would because it’s not like there are that many other foods that can naturally turn things pink. Beets, pomegranate, maybe strawberries? But blood orange makes it the prettiest shade of pink. Like the millennial pink! Can’t help it. It’s true. 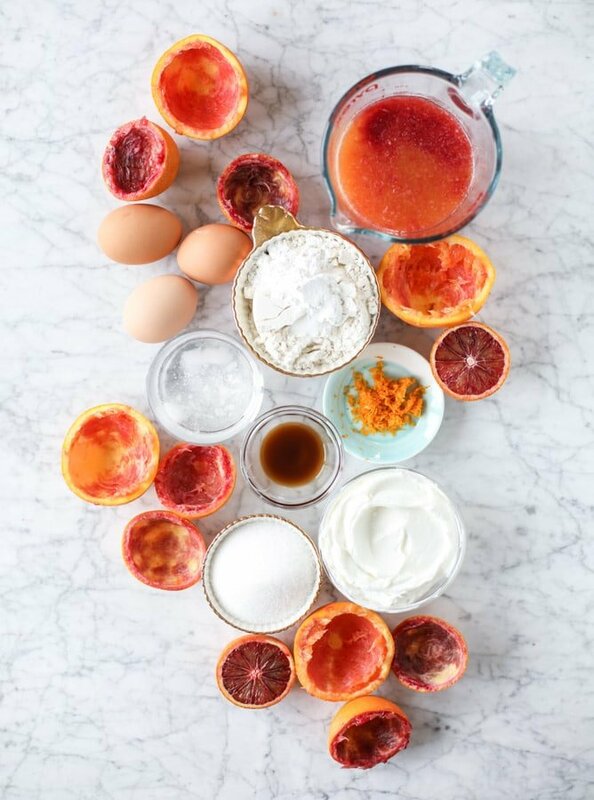 I also think that making candied blood orange slices to go on top would be amazing. Since I used this crazy wavy loaf pan, my oranges wouldn’t sit perfectly on top. But if you use a regular old loaf pan, go for it. Be extra. These are also my favorite kind of cakes to make because they are more acceptable for breakfast. Don’t you think? It’s like cake bread. So kind of like toast. Practically salad. If you ask me. One of my all-time favorite recipes is this blood orange coffee cake and while this may look the same, the two are completely different. I love both equally like they are my children. I’m thinking both can go on your menu this week. Preheat the oven to 350 degrees F. Butter and flour a 9×5 inch loaf pan generously. In a small bowl, whisk together the flour, baking powder and salt. In a large bowl, whisk together the yogurt and the sugar until combined. Whisk in the eggs, orange zest, juice and vanilla extract. Stir the dry ingredients into the wet, mixing until full combined. Use a spatula to fold the coconut oil into the batter, folding and stirring until the oil is incorporated completely. Pour the batter into the greased loaf pan and bake for 50 minutes, or until the center is set and a toothpick inserted comes out clean. Let the cake cool in the pan for 10 minutes, then remove it gently and set it on a cooling rack to cool completely. Once cool, pour the icing over top. Let the icing set for 20 minutes, then slice and serve! Whisk the zest, powdered sugar and juice together in a large bowl until smooth. Pour it over the cake once cooled. It’s just a cheery cake! Such a happy cake! I want that pan. hi gail! i don’t count calories so i’m not sure, but you can plug the ingredients into an online calculator if you wish! The citrus juicer! Every time I would watch Ina Garten make a citrus dessert I would think, dang I need to get one of those electric juicers. 10 years later I still don’t have one because I always promptly forget about cool gadgets like it. I hope you are enjoying yours- I love the photo of max using the juicer. Too cute! ahh right?! i don’t know why i didn’t want one before. it’s awesome. 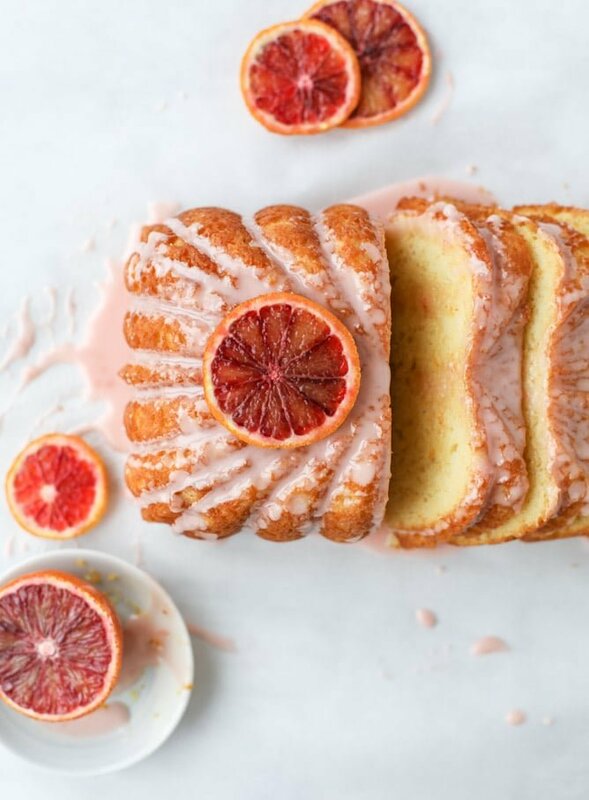 This cake looks gorgeous and I LOVE blood oranges!!! If I can find some at the store I’m making this this weekend!!!! You are killing me with this post! I just want to make all your recipes featured here and now I WANT the wavy loaf pan too! 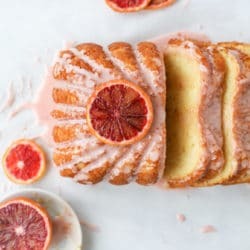 I love it and will definitely begin baking my way through this one starting with the blood orange version cause they are in season now! Thank you. Valentine’s Day is just around the corner….millennium pink, Perfect to counter all that chocolate! i find blood oranges at my local grocery store! Do you think canola oil can be substituted for the coconut oil? This is sooo beautiful and I’m sure, equally delish!! Could the loaf pan be easily swapped for a bunt pan? My bunt pan has pretty designs but not my loaf pan! This looks fantastic! 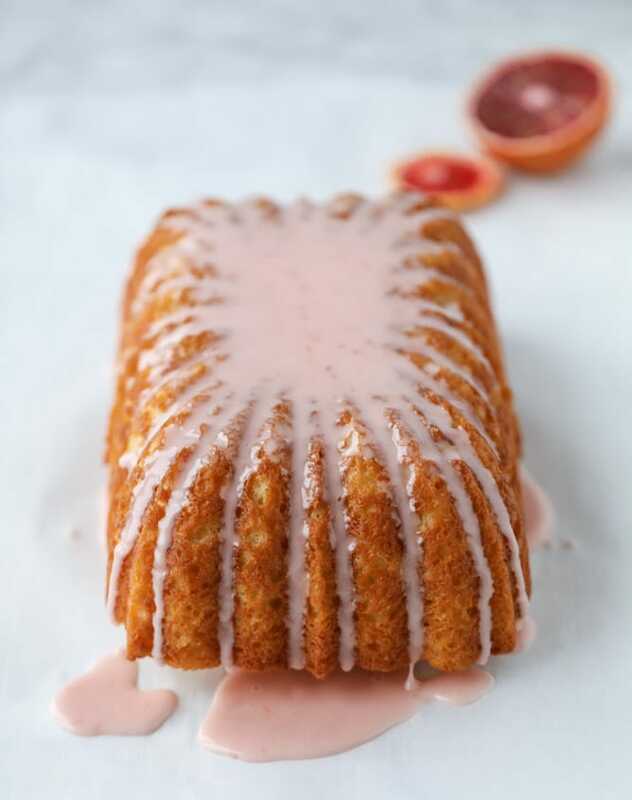 We always stock up on blood oranges when they’re in season, so this cake is definitely on the menu! So good!!! Made this tonight and we couldn’t wait for it to finish cooling before digging in, delicious! I just made this cake and it was delicious! The batter was more liquid than I am used to, so I added a couple tablespoons of flour… Is it really supposed to be quite runny? I used a mango yogurt instead of plain and it was yummy! 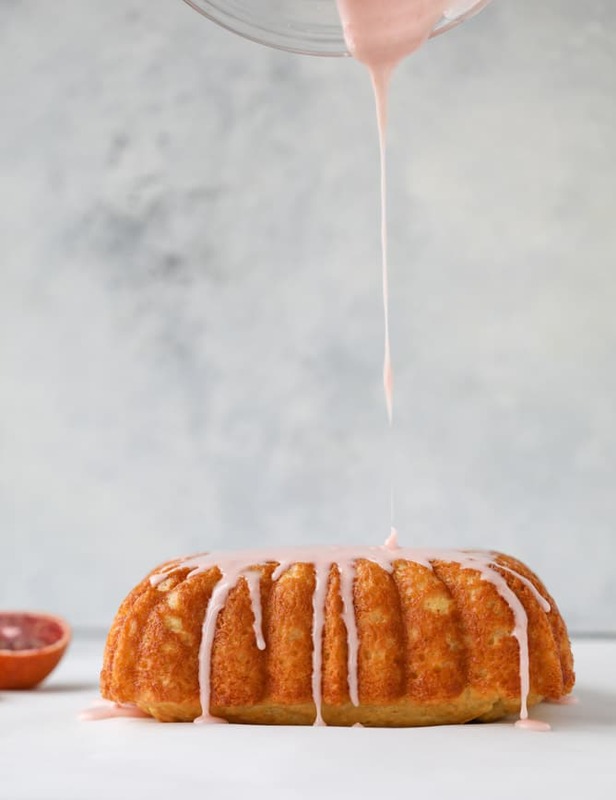 Is the glaze supposed to be whisked by hand? I am using a stand mixer and it is not coming together! My icing turned out much more orange than pink — wish mine was the pink you made but it was absolutely delish! Obsessed with the loaf pan you used. Can i justify buying it though? Hmm, valentines day perhaps. Could I make this and add cranberries? I currently have a bag leftover from thanksgiving dying in my freezer & I want to use them up! I just made this, bought the pan from Williams Sonoma to bake it in too. Oh my gosh, this is good!. I could not hold off twenty minutes for the icing to set. 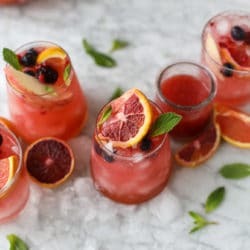 Thinking maybe I will go to the store for more blood oranges, then freeze the juice and zest so I can make this again when they are no longer in season. Next, I want to make your lemon loaf that is similar to this. Excellent and so pretty. My oranges were very red so my icing came out very pink. I did ad the caramelized orange slices! Orange improve your skin beauty. I was so excited to try this but mine came out incredibly dense with no air pockets whatsoever. I melted the coconut oil on the stovetop and stirred it in while it was still warm, Would that have caused my problems? The flavor was good but the texture made it practically inedible. I guess rubbery is a better description for the texture. I should say I also used fat free Greek yogurt in case that was the problem. Help! I really want to try this again. Made this cake and it was a disaster – the taste was lovely but it didn’t rise and the texture was all wrong, far too dense and wet. I think the recipe has way too much liquid. This is gorgeous!! Do you think this recipe would fill up a bundt pan? Planning on making it today! thank you! 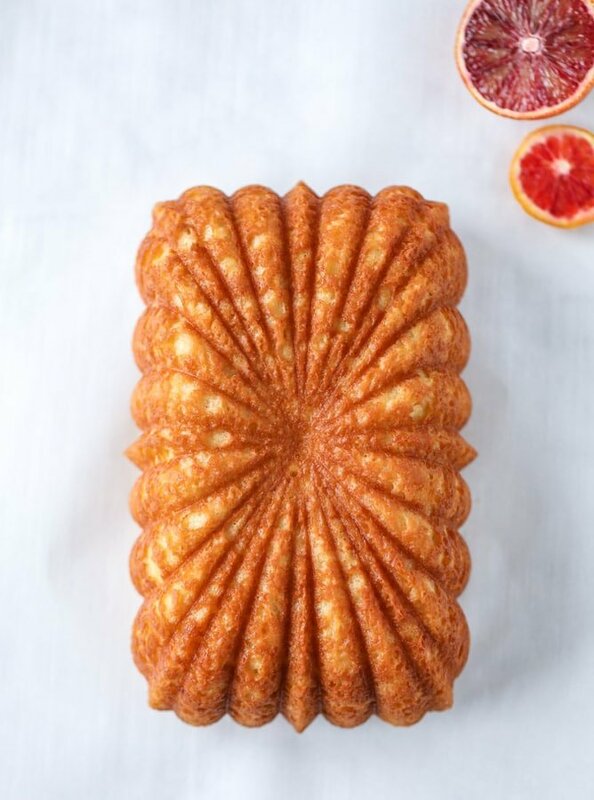 this is not enough to fill a bundt pan – you should do the loaf pan! Jessica—I’ve just made this recipe and am waiting for it to cool so I can ice it and eat it! The cake looks and smells delicious. In the meantime, though, I have a question about the fancy wavy loaf pan (which I don’t have): since the top of the cake becomes the bottom when you take it out of the pan, does the cake rise enough that you have to slice some off the bottom so it will sit flat? Thanks! Any recommendations or changes I should make if I am baking this at a high altitude?